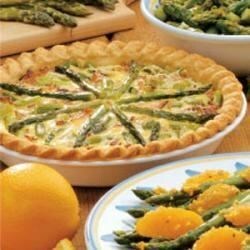 "Fresh asparagus stars along with bacon, onion and Swiss cheese in this hearty quiche. Field editor Mary Ann Taylor of Rockwell, Iowa sent the recipe." In a skillet, cook bacon over medium heat until crisp. Remove with a slotted spoon to paper towels; drain, reserving 1 tablespoon drippings. In the drippings, saute onion until browned; drain. Cut eight asparagus spears into 4-in.-long spears for garnish. Cut remaining asparagus into 1-in. pieces. In a saucepan, cook all of the asparagus in a small amount of boiling water until crisp-tender; drain. In a bowl, toss the bacon, onion, asparagus pieces, cheese, flour, salt and pepper. Pour into pastry shell. In a bowl, beat eggs and cream; pour over bacon mixture. Top with asparagus spears. Bake at 400 degrees F for 30-35 minutes or until a knife inserted near the center comes out clean and crust is golden brown. Let stand for 10 minutes before cutting. Quiche was good. I did not have onion so I substituted garlic. I also used turkey bacon instead of regular bacon. I would use less asparagus next time. Made this to take for breakfast for my pinochle group, we all loved it. Only problem, I should have made more. This turns out fabulous and looks pretty. I have used chicken in place of the bacon and that works, too. Add more asparagus! Chop some rather finely and mix into filling otherwise not everyone gets some. Also I sautéed the asparagus with butter and added chopped onions which were delicious.